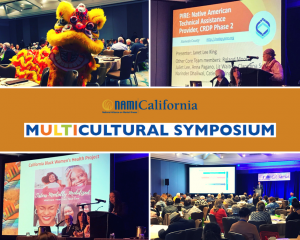 The Multicultural Symposium is NAMI California’s annual premier, statewide effort to convene leaders who serve at the local, regional and statewide levels. The goal of the Multicultural Symposium is to provide the opportunity for an open discussion on the successes and challenges that diverse and un/under-served communities face, and how we can better serve all individuals and families struggling with mental health challenges. Since 2014, the Multicultural Symposium has merged diverse communities from all over California in an effort to engage community leaders from public and private sectors in an open and candid discussion around best practices that can help us to better serve all individuals and families living with mental health challenges.